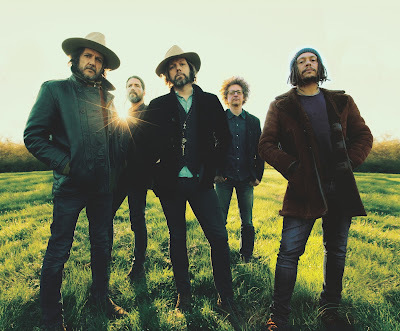 Formed in 2016, The Magpie Salute features leader and guitarist Rich Robinson alongside former Crowes bandmates Marc Ford and Sven Pipien, with vocalist John Hogg, keyboardist Matt Slocum and drummer Joe Magistro. “It’s the recontextualization of playing with one another,” explains Robinson. “When I was putting this thing together, I was thinking about how even though we may not have played for almost a decade, it just comes back immediately. The chemistry is unexplainable. The group’s original lineup included former Black Crowes keyboardist Eddie Harsch, who passed away in the fall of 2016. Due August 10, “High Water I” was produced by Robinson and recorded at Dark Horse Studios in Nashville, TN. "'Send Me An Omen,' to me, wraps up all of the elements of this band,” says the guitarist. “There's pure rock 'n roll juxtaposed with these pop melodies sung with a melancholy that creates this beautiful balance of surreal dark and light." The Magpie Salute will launch a series of summer shows with a free gig at Copper Mountain, CO on July 1; with dates booked into early fall, the band will mix headline appearances with an opening slot on the Gov’t Mule US tour.